Wherever it’s eaten, meat basically remains the same – it’s plant foods that transport our senses. Apply those flavors to vegan staples such as seitan or tofu and even straight-up vegetables, and the possibilities? If not endless, pretty darned expansive. 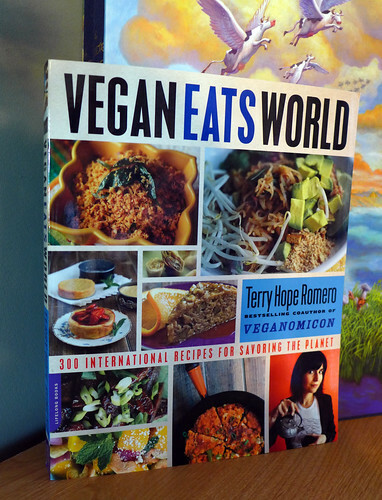 As a semi-reformed fussy eater, I was both nervous and excited when Da Capo Press offered me a copy of Terry Hope Romero’s Vegan Eats World: 300 International Recipes for Savoring the Planet for review. (Waaaay back in May, to celebrate the book’s release in paperback. I’m SO SORRY it took as long as it did, you guys!) Nervous because I knew that many of the recipes contained therein would fall outside my comfort zone and challenge me to try new things – and excited for the same. The recipes in Vegan Eats World run the gamut: there’s everything from soups and sammies to spring rolls, dumplings, and pierogies. Crepes, breads, and pies, of both the sweet and savory persuasions. Tofu scrambles, gyros, curries, and noodles. French tarts, Greek lasagna, Ethiopian tortes, and Egyptian soup. Romero traverses the globe in search of traditional dishes to veganize and otherwise “hack,” combining different ingredients and foodstuffs in exciting and unconventional ways. The result is a hodgepodge of recipes which hail from South America, Europe, Asia, and Africa, and are as mouth-watering as they are varied. There’s literally something for everyone here! 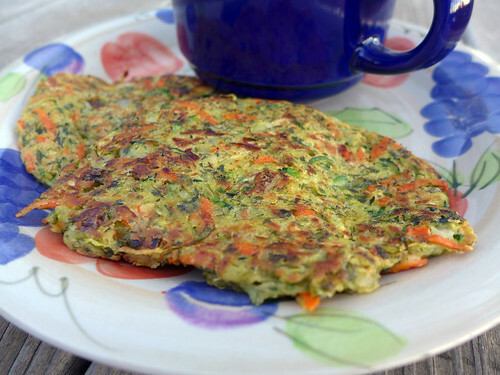 Along with the pesto for Sunday’s Butternut Squash Pizza, these Turkish Zucchini Pancakes from Vegan Eats World feature the very last of this season’s home-grown zucchini. (Yay! I did it! Now I can go back to stuffing my fridge with junk food!) Other goodies include carrots, white and chickpea flour, scallions, onions, and – an unexpected surprise for your taste buds – dill! I’ve made zucchini pancakes about a million and twelve times now, but these are the best I’ve had in recent memory. Maybe it’s because I actually took the time to wring out the zucchini shreds in a towel instead of just throwing them in a colander and leaving gravity to do all the work? Whatever, I’m not complaining. Plus the leftovers heat up nicely in a frying pan or on the griddle. 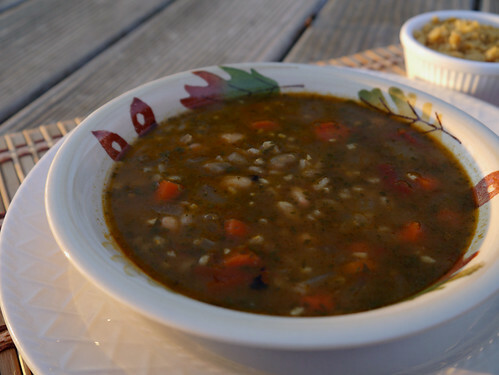 I served them with leftover White Bean Farro Soup, the picture of which came out much prettier (and clearer!) this time around. 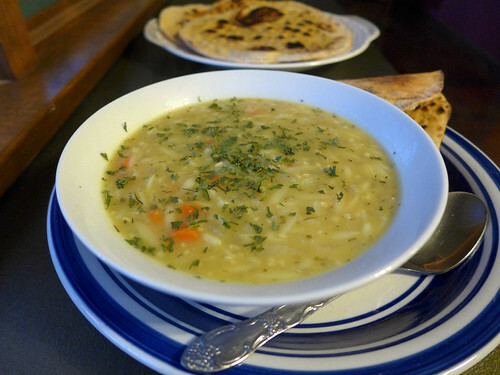 You guys, this might be my favorite Vegan Eats World soup yet! It’s super-hearty, with farro wheat berries (my first ever time trying them! and they are AWESOME! ), tomatoes, carrots, onions, garlic, and cannelini beans (or great white northern, in my case; forgot to go shopping, OOPS!). Spinach or escarole is optional; I shredded mine into little itty bitty pieces so it wouldn’t get all wilty and slimy. (HATE cooked leafy greens.) It gave the soup a nice, festive Christmasy feel and kind of overruled the need for parsley. Way tasty, all around. The topping is an Ethiopian/Mediterranean mashup involving cooked chickpea flour and lemon juice to make a tangy, parmesan-like garnish. It pairs most excellently with the soup and adds an unexpected kick. So good! I’ve already claimed dibs on the leftovers. 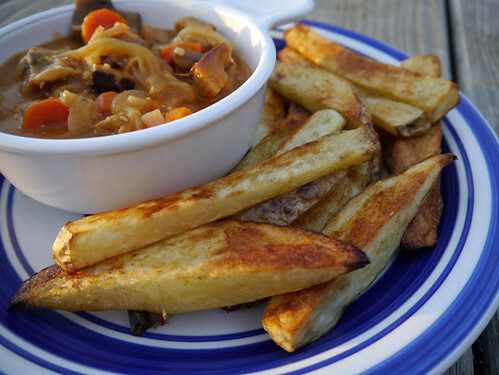 Continuing with our “enough onions to cry a small army to sleep” theme is this Beer-Bathed Seitan Stew from Vegan Eats World. This one’s got 3 yellow onions – a full pound and a half! My eyes were aching for hours after dinner, no lie. Even though I cheated and just used two onions. I KNOW I AM THE WORST. Also present: carrots, homemade seitan, dark beer (vegan, of course! ), mushrooms, and various spices and seasonings including but not limited to thyme (a ten on the savory spectrum), brown sugar, and tomato paste. 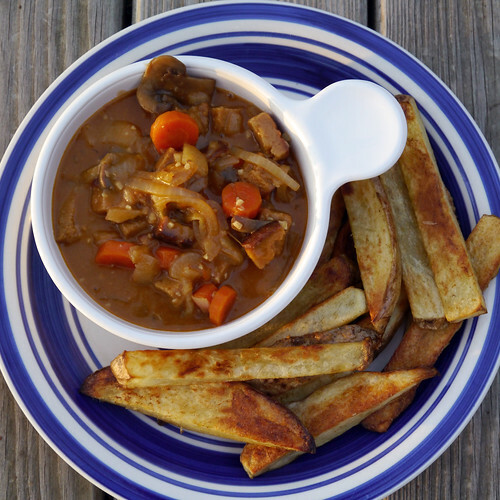 The broth is quite gravy-like, making this stew the perfect topping (or dip!) for oven-baked fries. I don’t know why I don’t make my own fries more often, y’all; do it right, and they are tastier than the frozen stuff by far. 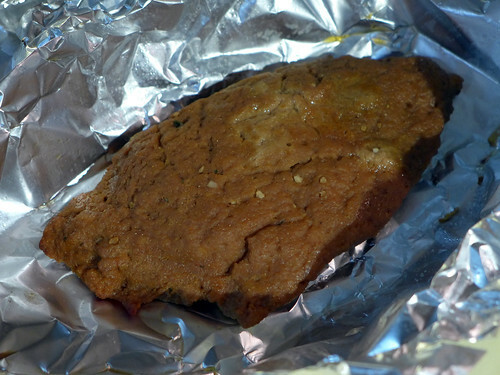 Shane was nice enough to make the Seitan Coriander Cutlets ahead of time, along with a batch of 5-Spice Seitan for his own snacking needs. (He likes to put them in burritos, along with some rice and beans.) The former are oven-baked while the latter recipe uses a steamer. He was happy with the results, but wasn’t so crazy about the amount of aluminum foil he burned through. Experiments with boiling the cutlets are forthcoming. Stay tuned! 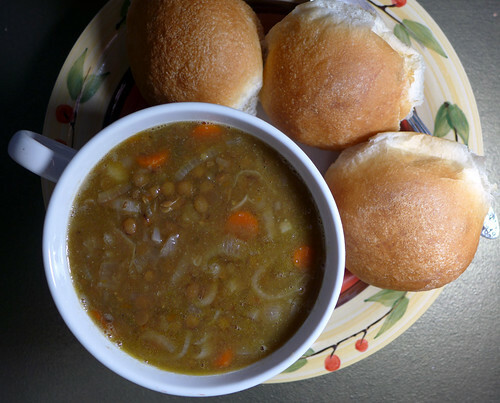 The Season of Soups continues with the “Like an Egyptian” Lentil Soup from Vegan Eats World. 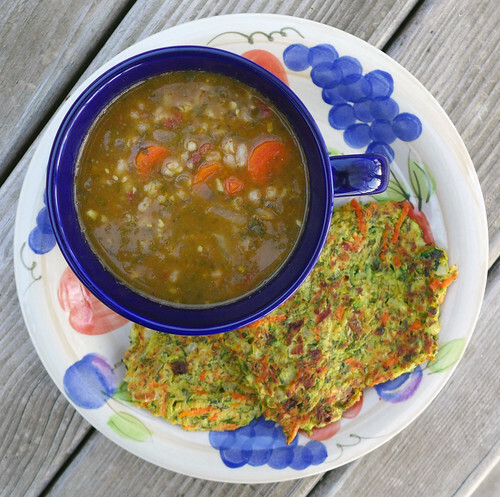 Super-yummy and easy to make, with lentils (green, brown, black – take your pick! ), carrots, fennel (love! ), cumin, coriander, and onions. 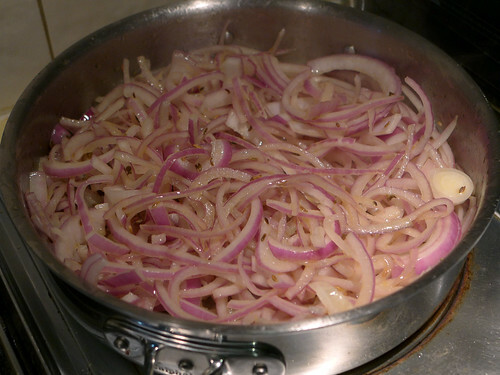 Lots and lots of onions: one yellow onion, added directly to the soup, and three red onions, caramelized first. My eyes are still recovering from all the onion-induced crying, y’all. I kind of cheated, though; my skillet could only easily fit two onions at a time, so I got a little lazy and just went with two red onions. I think it was just about perfect; any more and it might have skewed the onion-to-lentil ratio in favor of the former. Then I’d have to rename this “Like an Egyptian” Onion Soup. So much paperwork. An interesting side note re: the onions – you cut them in half and then slice them into half-moon shapes. These totes look like noodles once they’re added to the soup. It’s a little disconcerting. But also not a little tasty. Now that I’m knee-deep in apples, so begins my annual autumnal tradition: trying each and every apple recipe I can get my hands on. In the case of this Tenacious Tart Tatin (also known as a French Caramelized Apple Tart), it also means knocking another dish off my to-do for reviews list. 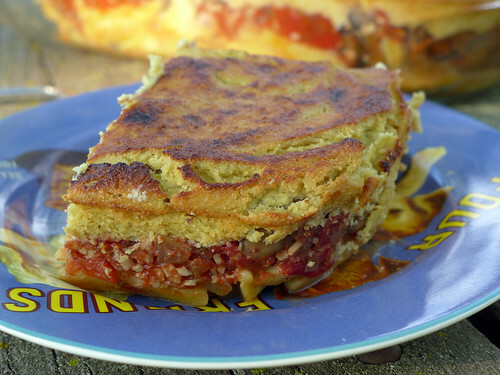 It’s from Terry Hope Romero’s Vegan Eats World, and is not nearly as fussy as its sounds. While the recipe does require a few rounds of waiting for stuffs to freeze (the olive oil and then the crust), I was able to spend that time peeling and chopping apples for storage over the winter. 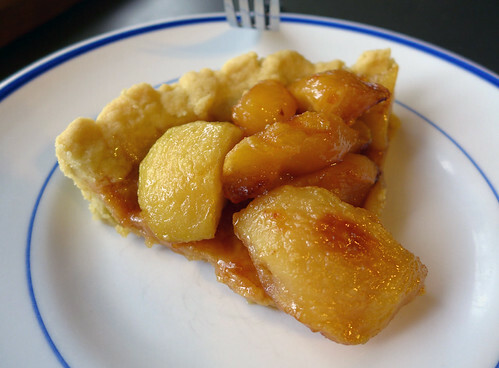 You need fresh, firm apples for this recipe, and I worried that my scrappy, home-grown fruit wouldn’t make the cut. Soft apples are prone to devolving into applesauce, you see. (Applesauce: also on the schedule for this month!) But I offset that by slicing my apples on the large side, which seemed to do the trick. For all its wonderful flakiness, the crust is pretty easygoing. You’re supposed to bake it in a springform pan, which I don’t have, so I just used a regular pie pan. (But not glass, on accounta the rapid change in temps.) I had some trouble slicing and serving the first few pieces of the finished tart, but otherwise it worked just fine. This is a seriously sweet tart, even by my standards. 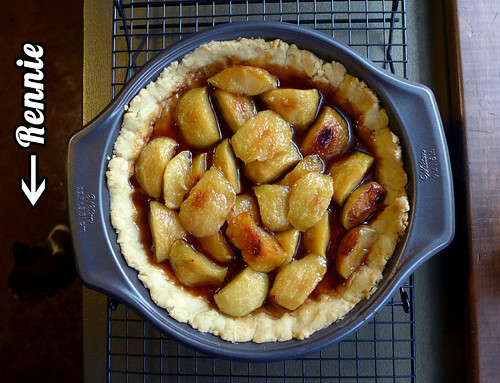 You cook the apples along with the caramel on the stovetop (they taste almost poached when done – so good! 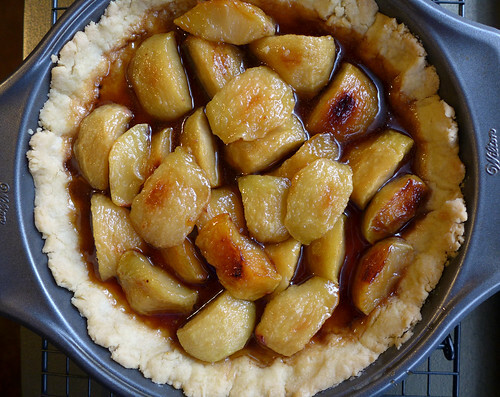 ), transfer them onto the tart, and then drizzle the caramel on top of the whole shebang. And there was so much caramel, y’all! I wonder if maybe I should have held some back. The apples made the house smell heavenly, and the scent even coaxed the dogs out of their rainy-day stupor – as evidence by a shamelessly begging Rennie in the above photo. Yes, I let her lick my plate. ALWAYS. Since the weather’s starting to turn chilly, I decided to concentrate on the soups: starting with this Creamy Lemon Rice Soup! Subtitled “‘No’ Govlemano,” this is a veganized version of the “zesty [Greek] classic egg-lemon chicken soup.” Which I’ve never had (I don’t think I ever tried an egg-based soup in my omni days! ), so I can’t really comment on its authenticity vis-à-vis the original – but I can say that it’s delicious: thick and creamy, with pureed white beans and both orzo pasta and arborio rice, the pairing of which adds multiple textures to the dish. And the lemon is unexpectedly awesome. I decided to pair it with naan bread, mainly because I wanted to see if I could do it. I don’t have such a hot track record with breads, you see. But the naan turned out to be super-easy to make, even if baking it in the cast iron skillet did smoke up the house a little. (Worth it!) I couldn’t find any vegan yogurt locally – it seems to have plummeted in popularity lately – so I used this recipe at Oh She Glows to make my own. I know, right! How cool is that? 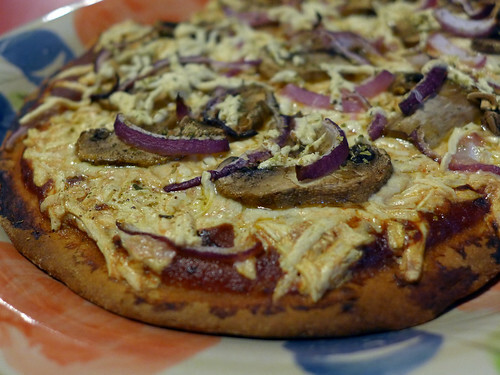 The leftover naan is perfect for baking individual quickie pizzas, pita pizza styley. The bread is a little thinner than pita and results in a floppier crust, but no complaints here. 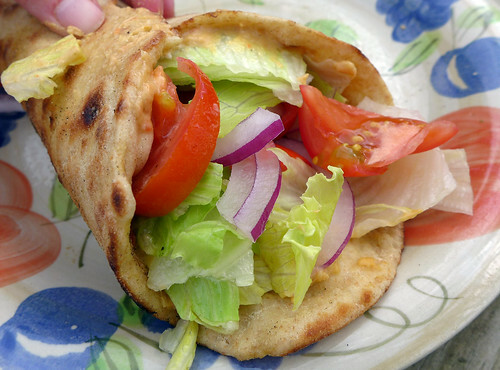 Incidentally, the flexibility of the bread also makes it awesome for hummus wraps. (Or is this considered a sammie?) 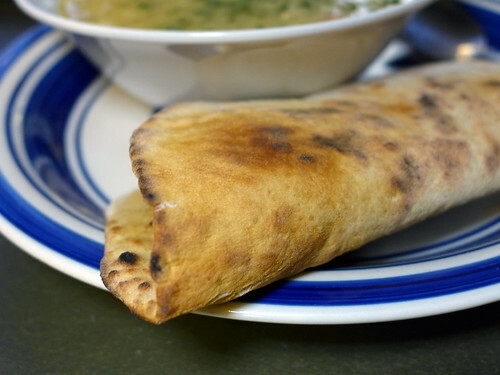 Naturally I overdid it with the fillings, so that the bread stood no chance of staying put when folded, but trust me when I say that it works even better for this purpose than the (thicker, less pliable) pita bread I normally use. This is definitely a recipe that’ll be entering into regular rotation ’round these parts. Ditto: the soup. Vegan Eats World this entire pan of Pastichio Vegani. As if The HappyCow Cookbook wasn’t keeping me busy enough, Da Capo Press sent me a copy of Terry Hope Romero’s Vegan Eats World for review. Two cookbooks at once; the insanity right? I can barely juggle one at a time. Originally published in 2012, a shiny new paperback edition of Vegan Eats World came out a few months ago. I liked the original cover well enough, but I’m seriously digging the paperback version. You know what I want to see on the cover of my cookbook? Food, food, and more food. Please! Since I’m a seriously fussy eater, I figured the international bent of Vegan Eats World would provide a nice challenge for my taste buds. I already have a list several pages long of the recipes I want to try (and a corresponding shopping list several miles long!) – but of course, my very first is a pasta dish. OF COURSE. 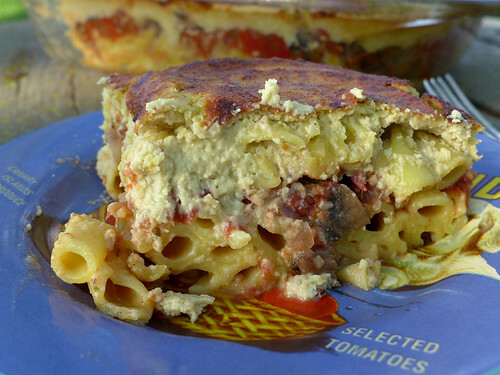 Greek Eggplant Lasagna, otherwise known as Pastichio Vegani, eggplant optional. This lasagna, you guys? Totally my favorite. Of all the times. For starters, it doesn’t call for lasagna noodles, so no laboring over a giant, steaming hot cauldron, gently stirring giant lasagna noodles while whispering a prayer to the great Spaghetti Monster in the sky that they’ll come out with minimal rippage. The top, cheesy, crispy layer is what Romero calls an “almost-Bechamel topping” (I hadn’t heard of Béchamel sauce until earlier this month, and now I’m seeing it everywhere!). It’s a tofu and cashew-based cheese that’s cooked until it’s firm and crispy brown on top. You guys! I could seriously just eat the cheese by itself. Then there are two layers of pasta slathered in a roux sauce (again, the roux is so surprisingly tasty that I could eat it as is) separated by a layer of chunky veggie sauce with mushrooms, tomatoes, onions, and garlic. 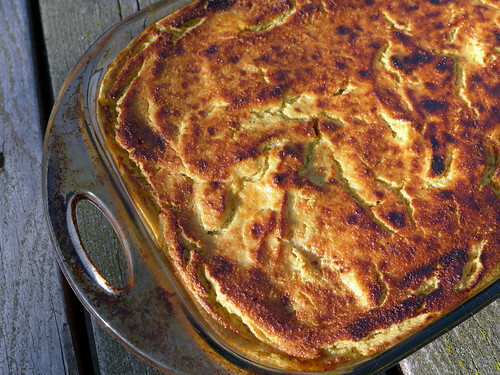 The sauce has a special surprise: a quarter teaspoon of cinnamon, complemented by the nutmeg in the almost-Bechamel topping. I have to admit, I was a wee bit nervous putting these two spices in pasta; it’s not my usual way of doing things. But the end result was pretty awesome: the cinnamon gives the sauce an extra kick that’s spicy, but not hot; and the nutmeg just rounds the cinnamon out. Hella good. Next time I’m totally gonna make this in a brownie pan. THEY’RE ALL CORNERS! So yeah, my first attempt from Vegan Eats World? A massive success. Luckily, there are only a few more Mediterranean-style pasta dishes here, so even if I play it safe and stick with pasta to start, sooner or later I’ll have to move on to more adventurous (to me!) fare.